Posted on July 3, 2014	by Katy K.
Even before I tried Scholastic’s earlier hit multi-author series, the 39 Clues, with my boy, I’d been wanting to read this one. It’s a fantasy with a very diverse cast, and all so far written by authors that like. I’d though to read them to myself, but instead, the boy and I have listened to all the ones out so far together. Wild Born. 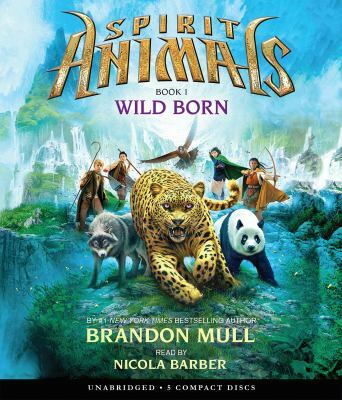 Spirit Animals Book 1. by Brandon Mull. Read by Nicola Barber. Scholastic, 2013. Hunted. 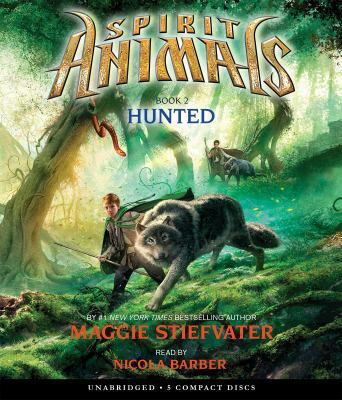 Spirit Animals Book 2 by Maggie Stiefvater. Read by Nicola Barber. Scholastic, 2014. Blood Ties. 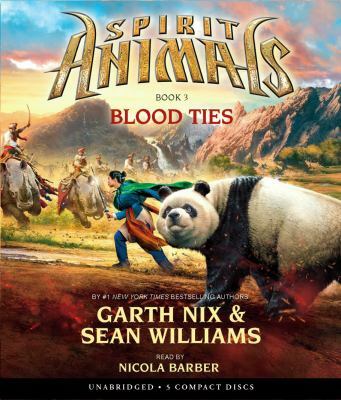 Spirit Animals Book 3. by Garth Nix & Sean Williams. Read by Nicola Barber. Scholastic, 2014. The world of Erdas is watched by powerful animal spirits. Working on their behalf, people who have magical relationships with “spirit animals” act as the guardians of Erdas – the Green Cloaks. All children take part of the Nectar Ceremony at age 11, when they are given a special drink. If they are going to have spirit animals, this ceremony is the time when the spirit animal comes to them. There’s no predicting which people will call spirit animals, or what animal will be called – anything from mice to bears. But all animals give their human partners special powers, and can take the form of a tattoo on their human as needed. As our story opens, we meet four kids from different backgrounds and corners of the earth, all about to have their nectar ceremonies. All but one of them have no expectations of calling a spirit animal – but they call not just regular spirit animals, but the spirits of the Four Fallen, Great Beasts who died protecting Erdas. The ancient Devourer whom they died defeating has risen again, and it’s up to these four children – who haven’t even met each other yet – to stop it by finding the talismans of the still-living Great Beasts before the evil Conquerors. Well… this was an unmitigated success with my son, who is already planning to have a nectar ceremony for his birthday party when he turns 11 in late 2015. (He’s hoping for a cheetah spirit animal.) My feelings were a bit more mixed. On the one hand, I really appreciate that the kids are from all over and have varied skin colors and economic backgrounds, and that the girls are good at the fighting side of things – Meilin at martial arts and Abeke at bow and arrow. The concept is nifty. I like that the authors are trying to develop them as characters, and that the relationship with the spirit animal is something that all the children have to work on. Unfortunately, though, they seem to be going through the same character development arc every book so far – hopefully that will change soon. Three books in, I’m already a little bit bored with just looking for a new talisman every book, especially when it’s not really clear to me why taking the talismans away from the Great Beasts is really going to be helpful. I have mixed feelings about Nicola Barber as a narrator, too. She’s clearly a talented narrator, but she voices pretty much everyone with some variation on a British accent. On the one hand, this works well at highlighting the class differences between the kids – I’m pretty sure I couldn’t tell a lower class Latin American accent from an upper class one. On the other hand, the geographical differences aren’t addressed at all. Since the continents are clearly modeled after Earth continents, it would have been cool if Abeke and Meilin sounded African and Chinese instead of upper class British. And when they start travelling across the world, the British accents seem even more inappropriate, as the dwellers of a remote jungle tribe in something like South Asia speak with a thick Scottish burr. Also, this is an adventure series, so I expect action scenes to be treated as exciting. But Barber’s voice, instead of getting louder and faster at these moments, gets hushed and slow. It’s successful in conveying the gravity of the situation, but it makes the kids sound timid instead of brave. In the first book, Wild Born, the four kids meet their spirit animals and are met by people waiting for them – some by Green Cloaks, some by servants of the Devourer. Will they all come around to the right side in time? Also, looking for the first talisman on Rollan’s home continent of Amaia, but in the wild mountains rather than his familiar city streets. In the second book, Conor’s conceited former master returns as a villain serving the Devourer, willing to do anything to get back at Conor for having a spirit animal when Devon didn’t get one. All four of the kids work harder to bond with their spirit animals, and are having difficulty working as a team. The talisman this time is in Eura, and the adult help they’ve come to rely on is not able to help as much as before. It’s also very close to Conor’s home town, and he of course does not know of the danger awaiting him. In the third book, Meilin and her spirit animal, the great panda Jhi, are lost in the bamboo maze trying to reach her father in Jhong, where she meets Shu, a delightful retired Green Cloak with a jumping mouse for a spirit animal. The others are trying to catch up by boat from a different direction, and have shifted which person on their team they don’t trust. They are searching for the slate elephant talisman of the Great Animal Dinesh in something like southeast Asia. Writing about this is bringing up more positive feelings than I had while listening to it – and maybe I would enjoy them more reading them over listening to them. Maybe it’s just tough to write a really solid series like this, projected to be really, really long, with a different author for each. In any case, I would say that I enjoyed these but didn’t love them as much as I wanted to, but my son is a huge fan. I would definitely recommend this to kids ages 9 or so and up looking for an exciting fantasy series. This entry was posted in Books and tagged diversity, youth audiobooks, youth fantasy. Bookmark the permalink.